Check out our sweet HeroesCon Variant cover for Avengers X-Sanction #1! It was announced this week that 2012’s big Marvel event will be Avengers vs X-Men (I loved that Marc Silvestri mini-series when I was a kid!) and this is where it starts! You can get yours at the store next Wednesday! We’ve also created a listing on our eBay store for pre-sales. 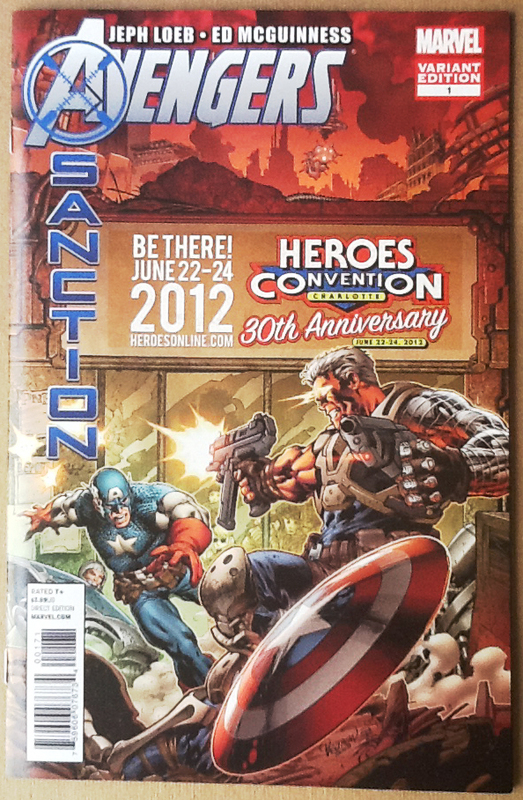 Heroes Aren’t Hard to Find and Marvel Comics are offering a HeroesCon 2012 variant cover of this book that kicks off 2012’s Avengers VS X-Men Crossover! This book is extremely limited and by ordering today you ensure you will have a copy of this book when it comes out next week. All orders will ship Wednesday, December 14 when this book hits stands! CABLE IS BACK! AND HE’S GOT JUST 24 HOURS TO WIPE THE AVENGERS FROM THE PAGES OF HISTORY! How has Cable been reborn? Where has he been since “Second Coming”? And what dark event has driven him to destroy the Avengers? The answers are just the tip of an iceberg that threatens to smash the Marvel Universe to smithereens! THE COUNTDOWN TO 2012’s STATUS QUO-SHATTERING EPIC BEGINS HERE!